Sara O. Reviews ’20 Feet From Stardom’!!! 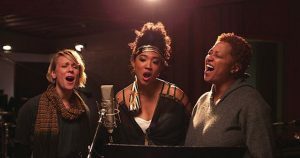 If you’ve ever wondered what it’s like to sing back up for some of the world’s greatest artists, Morgan Neville’s ‘20 Feet from Stardom‘ gives you a first-hand look. Sometimes humorous, often heartbreaking but entertaining throughout, Neville uses a series of interviews that span the decades to tell that story and include archival footage of Phil Spector, Sting, Mick Jagger and Bette Midler—just to name a few. The film includes a history of background singing from its beginnings in the early 50’s to present day. Each personality and profile seem to have the same story: preacher’s daughter, gospel roots, joins a music group, tries to make it on her own, and…nothing. However, that simple story diminishes what those artists brought to music—the heart-wrenching voice in “Gimme Shelter” by The Rolling Stones, for example. Present day, it focuses on Judith Hill, who most famously sang backup on Michael Jackson’s last tour before he died and at his funeral. Her story/career isn’t finished yet and as she tries to break into a solo career, you’re left wondering if she’ll fall the way of all those before her. In some ways, this movie tries to make amends for the hardships encountered by the early background vocalists. Mostly it shines a light on some of the best untold stories in music’s history. For music lovers, this gives great footage and insights to decades of music. For others it’s an entertaining documentary that will leave you adding some old favorites to your playlists. Personally I recommend ‘20 Feet From Stardom‘ for the little-known music knowledge you’ll be able to impress your friends with and the amazing soundtrack. This entry was posted on Thursday, June 27th, 2013 at 10:32 pm	and is filed under Film, Music, News. You can follow any responses to this entry through the RSS 2.0 feed. You can skip to the end and leave a response. Pinging is currently not allowed. « Fernando Reviews ‘White House Down’ and Loves It!!! [pointing his pistol at Sam] You stupid shite! You're a dead man!